Sometimes I find myself getting overwhelmed with all the daily tasks that I need to accomplish each day. Not all the time, but just when things are go, go, go and I can't seem to catch my breath and get a tiny break. 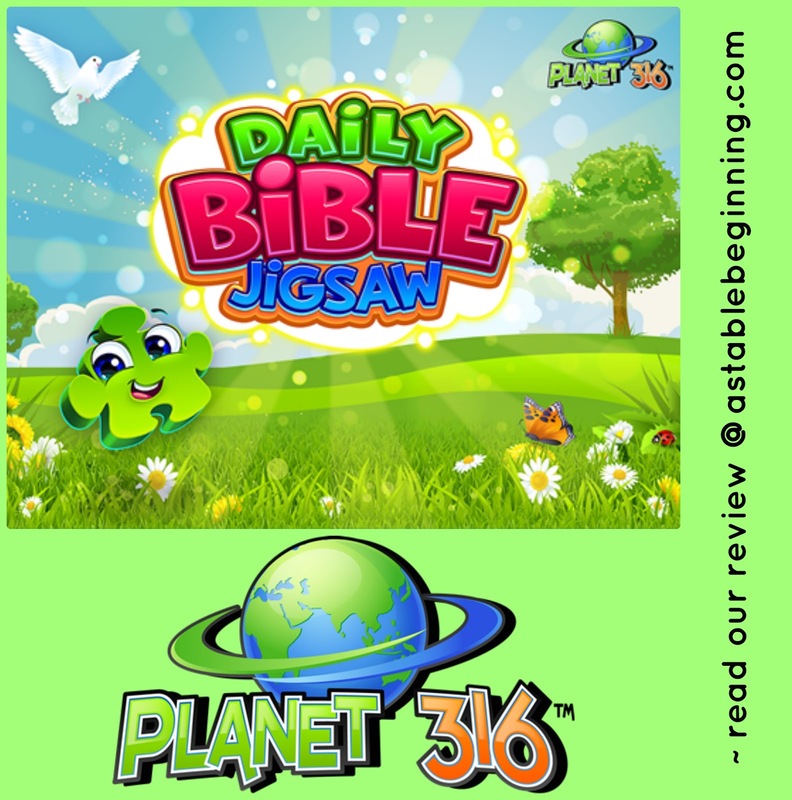 But you know what I have found to be a great sanity saver, the Daily Bible Jigsaw from Planet 316. I have really enjoyed playing it, so let me tell you a little more about it. Planet 316 seeks to connect people throughout the generations to bring them closer to God. 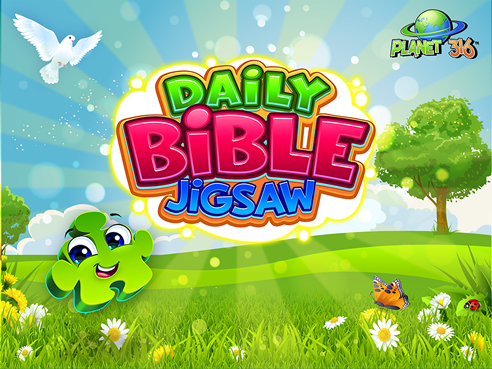 Their goal is for the puzzle games to spark conversations about God and bring people closer together through the message of the gospel in a fun an exciting way. Getting started with the app is quick and easy. I simply downloaded the app and went through the quick and easy registration process, then I was on my way to playing. We were gifted 500 puzzle coins for the purpose of this review and they came in so handy. You don't need puzzle coins but you can play more puzzles each day if you have them. Since the puzzles were conveniently on my phone, I would literally play the puzzles when I was at the ball field waiting for my older daughter or while at the gymnastics gym waiting for my other three daughters to be done. It was my way to relax and unwind for a few minutes especially when I knew I would have a beautiful picture like this with scripture at the completion of the puzzle. 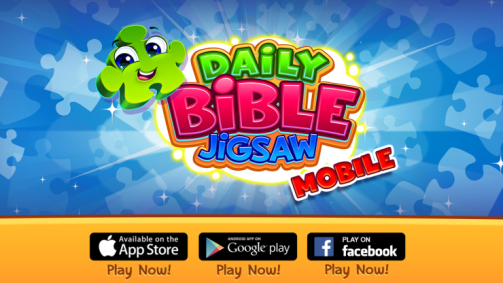 Daily Bible Jigsaw is a delightfully, relaxing puzzle app that can be played through the app or on Facebook. 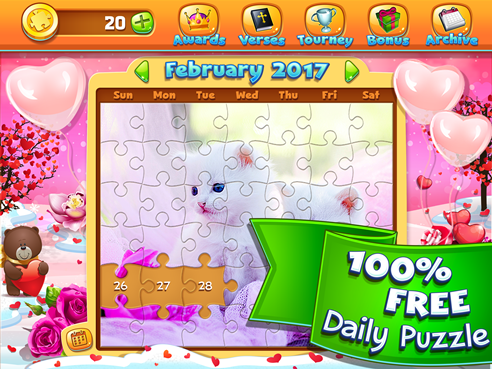 Each day there is a free new puzzle to complete. Or you can purchase puzzle coins so that you can go back through the archives and play more puzzle games. Trust me, you will want to go back through the archives to play more puzzles because it is just so much fun! I especially enjoyed this app and working through the puzzles each day. I am competitive by nature and found it a fun challenge to make my way up the ranking ladder to the 2nd place spot in the weekly challenge by completing 111 puzzles. It didn’t seem like work doing the puzzles but more fun seeing my name rise up and up the ladder. Overall, I would recommend this puzzle app for you, especially if you are looking for fun and relaxing at the same time! My kids always tried to play too so they spent a few of my coins when I wasn’t looking. But I didn’t fret because the app is family friendly and I didn’t have to worry about any questionable “stuff” popping up while they played. Be sure to check out what my CrewMates by clicking the banner below to read there reviews.